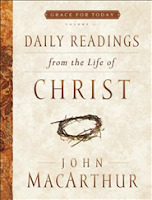 Today's giveaway is a 365 page devotional book by John MacArthur called "Daily Readings from the Life of Christ." If you're not familiar with the teaching/preaching ministry of Pastor MacArthur, just click here and start anywhere - it's all good! This devotional book by John MacArthur is meant for every believer. Jesus Christ is the climactic centerpiece of all God's work-past, present, and future-and this daily devotional focuses on Christ and His Word. With insights on the life of Jesus, thoughts to ponder, and wisdom gleaned from years of careful study, Daily Readings from the Life of Christ delivers a fresh realization of the grace of God in Christ for each day. Your hungry heart will be focused on God and His Word. This first volume will take you through the first year of our Saviour’s public ministry. I am so thankful for the pastors under which God has placed me in the local church. There are also men such as John MacArthur that have had a significant influence in my sanctification (i.e., growth as a believer). So, aside from your local pastor(s), tell me who your "favorite" radio or print pastor is & why. I'll randomly pick a winner from all the entries. Again - for the record - we should be careful of this. Thanks, Aaron. My favorite pastor in print or hearing in person is John Piper. I would have said Jonathan Edwards, but never got to meet him. Piper breathes humility and is faithful to preach the Scripture expository, passionately, and just seems to punch me in the guy AND pat me on the back each time. I'd highly recommend his new book, "Finally Alive," as well as his staples, "Don't Waste Your Life," "Desiring God," and "Let The Nations Be Glad" to name a few. I can't help myself, I want to comment! I really like C.H. Spurgeon. My pastor reads from his autobiography every Wednesday night before Bible study, and I read his "Morning and Evening" every, well, morning and evening. The depth in which he can go into for a single Bible verse is amazing. Also, his sermons are full of humility and most importantly centered on Christ. I read his devotional in the morning before my quiet time, and it's like having a mini-sermon before diving in the Word! Plus, his commentaries on the Psalms are amazing. Spurgeon (dot) org is a great resource. Funny thing about that pyro post. My pastor is mentioned in it, and he has spoken before about the dangers of having too much devotion to other pastors. Hey, look! I won!!! :) Thanks, Aaron. I look forward to reading the book from last week and letting you know what I think 'bout it. There are too many to narrow it down to one, but I will tell you that Nancy Leigh DeMoss and Lance Quinn were both used by God to save my marriage in 1995. Their teaching will also hold a special place in my heart because of that. John Piper has probably been the other most influential author I have read. His book, "Desiring God" made quite an impact on my life early on. Since then, he has influenced me and my son, Luke, through "When You Don't Desire God" and "Don't Waste Your Life." I had the opportunity to hear him at True Woman last year and it was neat to see him face to face.